Sultanpur host more than 250 species of birds, both migratory and residential. During the months of November to March, migratory species such as greater flamingo, ruff, black winged stilt, common teal, common greenshank, northern pintail, yellow wagtail, white wagtail, northern shoveler, rosy pelican from East European countries and all across the globe. These birds put up a wonderful show that you can’t afford to miss. While some species flock together on branches, some others can be seen on the water bodies, they offer a picturesque panorama. 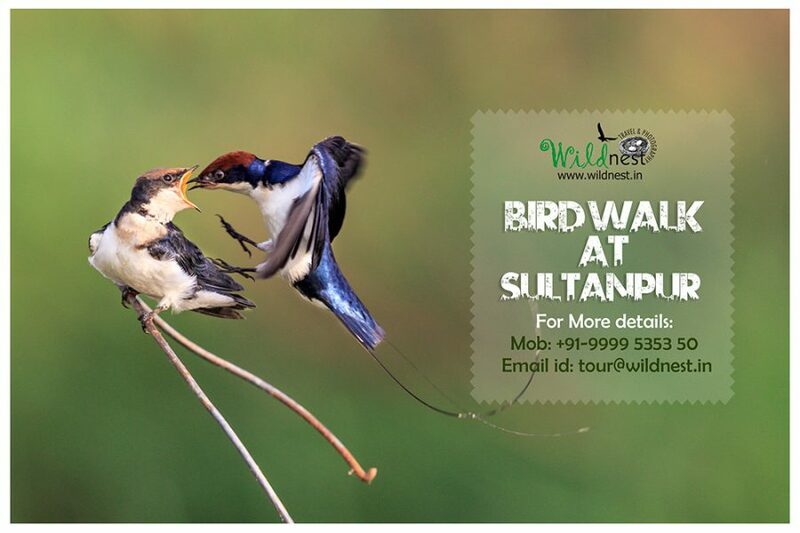 Sultanpur indeed is a bird watcher’s paradise. Dates: Booking is open on first come first serve basis, one session can accommodate maximum of 25 people so please book your ticket in advance for this day walk tour. Per Person cost: INR 860 (Indians only), Min 8 pax and Max 25 Pax for book as early as possible. About: This walk is aimed at gaining knowledge about bird’s species so explore some of the best species of the wild at one place. • Outside food is strictly a no-no inside the park. • Do carry a water bottle and sun protection gear since you will be roaming around the park for majority of the time. • Wear good walking shoes and comfortable, loose clothes, nothing flashy. • Fully charge your camera and backup and format your memory card! Avoid carrying your entire kit. • Just your main camera body with the longest telephoto lens you have.